First, State Department Spokesman Jen Psaki (who also worked as a spokesman for the Obama campaign) denied Kerry was in Nantucket despite multiple reports, sitings and a Kerry motorcade traffic jam. Kerry spokesperson Jen Psaki denied the report. “Since his plane touched down in Washington at 4 am, Secretary Kerry was working all day and on the phone dealing with the crisis in Egypt,” Psaki said in a statement. Earlier a State Department spokesperson said she could not comment on Kerry’s whereabouts on Wednesday, but said Kerry is kept in the loop on all the latest developments. “The secretary’s department is in touch with officials regarding the developments in Egypt at all levels at all times,” State Department Press Secretary Beth Gosselin said in a statement. State Dept's @jrpsaki says re CBS tweet on @JohnKerry: "Any report or tweet that he was on a boat is completely inaccurate." Then, Psaki admitted Kerry was on his boat "briefly" after saying reports of Kerry being in Nantucket were completely false. And yes Secretary Kerry, this looks pretty bad. U.S. Secretary of State John F. Kerry — who spent the Fourth of July on sun-splashed Nantucket even as the chaos from a military takeover rocked Egypt — drew fire from Republican critics who said it’s a bad time for the nation’s top diplomat to be seen cavorting on an island getaway. As first reported on bostonherald.com, Kerry, who owns a house and a yacht on the ritzy retreat, was seen yesterday strolling down Federal Street away from July Fourth festivities on Main Street in jeans and a light-colored polo shirt. Later in the afternoon, Kerry was seen offloading bags from a single-person kayak to a boat in Nantucket Sound after launching from the beach behind his home at 5 Hulbert Ave.
Republicans pounced on the image of the vacationing secretary of state and sought to use it as a symbol of what they deem a big Obama administration failing — the inability to convey a clear message on foreign policy on hotspots like Syria, Turkey and Egypt. “I would think the secretary of state would interrupt his vacation and at least send a very clear signal — even by flying back to Washington for a day or two — that on our Independence Day we are very concerned about the freedom and democracy that we hope is instilled for some period of time in the Arab World,” said Patrick Griffin, a New Hampshire-based GOP strategist. 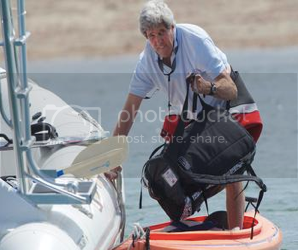 Then of course, Psaki tried to run cover by reassuring everyone Kerry was hard at work solving the world's problems...from his kayak of course. Kerry’s staff yesterday insisted he’s fully engaged and has been logging long hours and high miles, including a recent 12-day, 25,000-mile trip to the Middle East and Asia. Yesterday he dialed into a meeting with President Obama and members of his national security team in the Situation Room, according to the State Department. Kerry also called foreign dignitaries from Egypt, Israel, Norway, Qatar, Turkey and the United Arab Emirates. “Secretary Kerry has been working tirelessly around the clock since he returned from his 10-day trip and there has not been a moment where he has not been focused on doing everything possible to communicate with his team in Washington and in Egypt, within the administration and with his counterparts around the world,” Kerry spokeswoman Jen Psaki told the Herald last night. As a reminder, the violence in Egypt was expected to be so bad, the State Department pulled all U.S. diplomats. But hey, Kerry had some tanning to do, okay? The State Department has ordered all nonessential U.S. diplomats and the families of all American Embassy personnel to leave Egypt in anticipation of potential violence. And in case you're wondering, things in Egypt are just getting worse. Egyptian troops reportedly opened fire Friday on supporters of ousted President Mohammed Morsi outside the Republican Guard headquarters, where he was believed held, but there were conflicting reports on casualties. The Associated Press, which had a photographer at the scene, said at least one protester was killed. Citing security sources, Reuters reported security forces fatally shot three demonstrators.